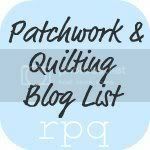 A collection of quilters blogs and a few other assorted places around the web. First up some information about caring for those quilts. He quilts, he carves, and the Flower Girls next door have a resident gnome. The best collection of free patterns I have found! Calender of celebrations ….. pretty much one every day of the year.